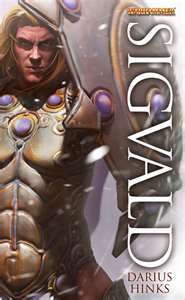 Every morning Falcio Val Mond wakes up debilitated, but his fellow Greatcoats still look to him for guidance and – more importantly and on an alarmingly frequent basis – a plan. Falcio has a lowly-raised princess to make a queen and a highly-raised and recently-fallen peasant to make a warrior and deliverer of justice, as well as the dukes and the people to appease. Not too much to do then! 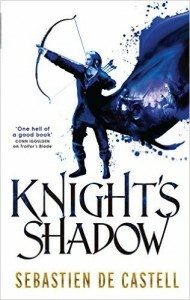 Falcio is still one of the wittiest first person protagonists in recent fantasy, his self-deprecation and wry humour making even the grimmest parts of this book a joy to read. Knight’s Shadow retains the easy reading quality of the first Greatcoats book, with a well-plotted story unfolding to a rousing conclusion. 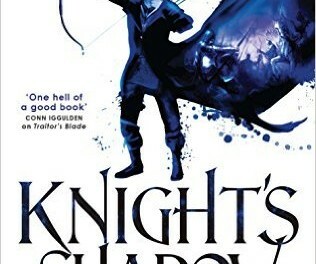 This is an adventure story with a band of brothers-and-sisters in arms, but on an epic scale with a modern feel, and Castell demonstrates once again that this series should not be underestimated. Laughs, triumphs, the mysteriously-talented, poison-wielding assassins, saints, gods, swords and bows – it’s all in there and not a bit of it feels out of place. Definitely a recommended read.